On my previous trips to Dublin, I had walked by Trinity College many times but never ventured inside. I had heard that the library was a must see even if you just have one day in Dublin but just brushed it off. 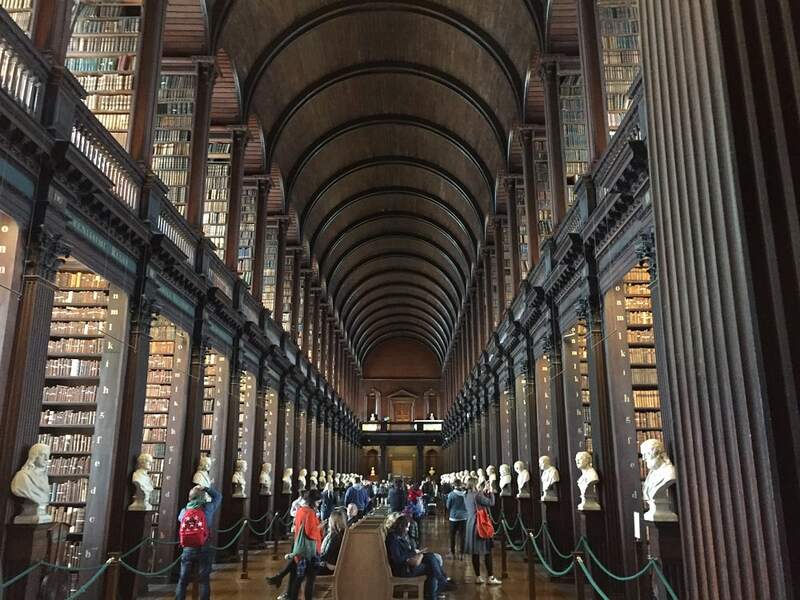 It’s more than just a place for book lovers, the Book of Kells exhibit in Trinity College is an interesting lesson in art, history, and religion. And if that is not enough, the Long Room upstairs is just visually stunning and filled with so many amazing books. A view of the front of Trinity College. The Long Room……just look at all those books! So you may be wondering what is the Book of Kells and what is so special about it? Well, first of all, it probably dates back to the 9th century. It may have been commissioned to celebrate the bicentenary of the death of St. Colum Cille who founded the monastery in Iona. At one point it was stolen, then later returned and for security purposes, it was sent to Dublin in 1653. Since there are textual errors and such ornately decorated pages, historians believe it was for altar furniture for special occasions rather than for daily use. You don’t get to see the Book of Kells right away. You first have to go through the exhibit which helps you appreciate the book and learn some Book of Kells facts. First, you learn about how the Book of Kells was made. I hadn’t thought about it before but obviously, they don’t have the tools that we do now to be able to make books. They actually used 185 calf skins to make the pages. They were very resourceful and used various things such as gypsum, green clay, and indigo indigotin to get the colors that they needed. The Book of Kells exhibition also helped explain some of the symbolism in the Book of Kells. I really appreciated the display that explained the most celebrated page which is called Chi Rho. Chi Rho is the name of Christ abbreviated in Greek form. There are so many details on this page. If you look closely, in addition to the elaborate Book of Kell letters you can find fish, mice, cats and even an otter. After the exhibit, you enter the room where the actual Book of Kells is stored. Since it was divided into four volumes in 1953, you can see four different pages, all under glass. They also have enlarged versions of some of the Book of Kell pages on the wall for you to examine closer. Once you have finished looking at the Book of Kells, then you go upstairs to the Long Room. 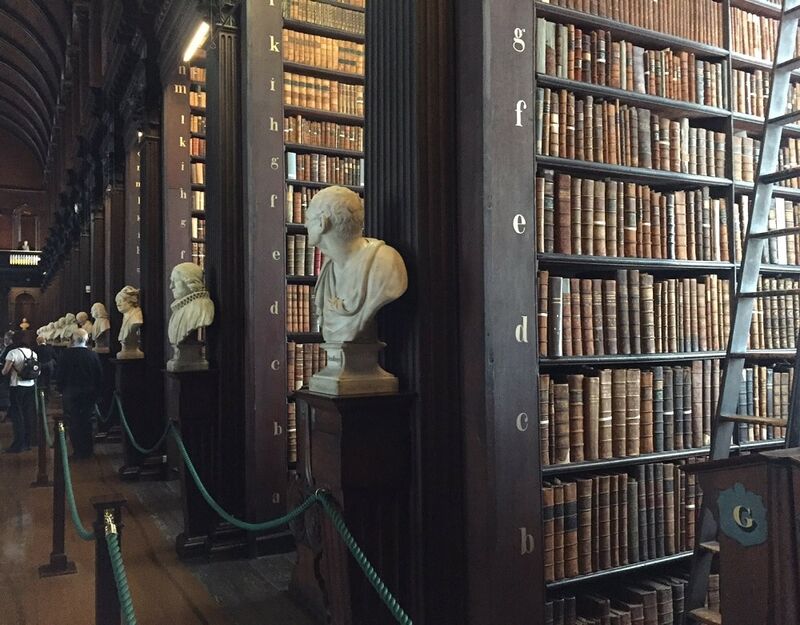 This famous Dublin Library is covered in dark wood and full of countless old books. The books went all the way up to the ceiling, and each section had ladders to reach the top shelves. Along each side, there are busts of various famous men including Socrates, Shakespeare, and even some I weren’t sure who they were. It is quite the site to see. Many people mistakenly think it that the Trinity College library was a filming location for the Harry Potter movies, but that library is actually in Oxford. Also, towards the far end of the room, you can find the Brian Boru harp inside a glass case. It is the oldest surviving Irish Harp and the national symbol of Ireland is modeled after it. Although it is mistakenly linked to Brian Boru who was king in 1014, it probably dates from later in the middle ages. It was presented to Trinity College in the 1700s and then restored and restrung in 1961. As with other popular tourist attractions, there can be a long line to get inside. We arrived at about noon on a Saturday and there was a queue. So I definitely recommend buying your Book of Kells tickets for timed entry online before you go. Check out this list if you are looking for free things to do in Dublin. Book your tickets in advance you don’t want to be waiting in this line. It is also worth mentioning that the campus of Trinity College is beautiful and worth exploring. We walked around a bit before we went inside the library and took a few pictures, but they do also offer 35 minute guided tours. While you can get a combined ticket for both the tour and the Book of Kells for 13 euro, you cannot purchase it in advance. Given the popularity of the Book of Kells exhibit, I would recommend booking that in advance and then showing your tickets to get the tour for an additional 6 euro. While you are in Dublin, you should also visit Dublin Castle. It has a fascinating history! The campus of Trinity College is beautiful and definitely worth exploring. I really thought the Book of Kells exhibit was interesting and the Long Room was just beautiful. 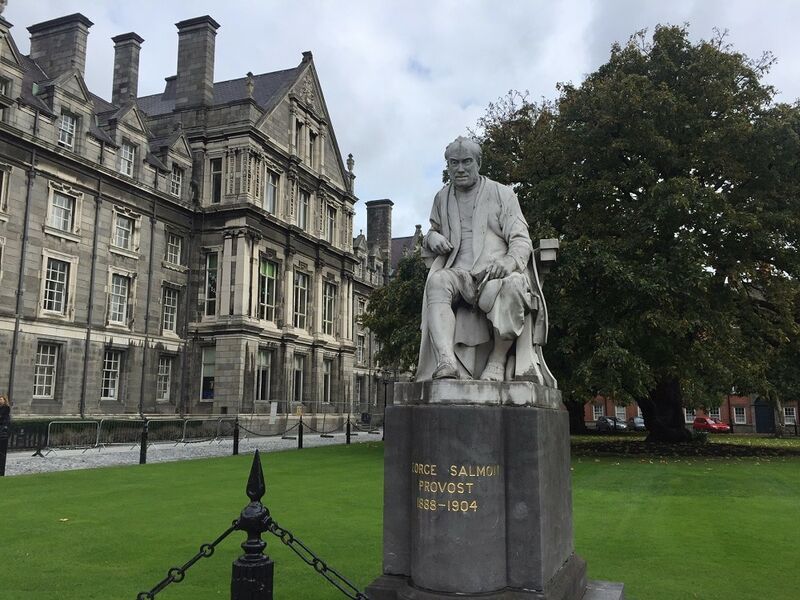 Have you visited Trinity College? 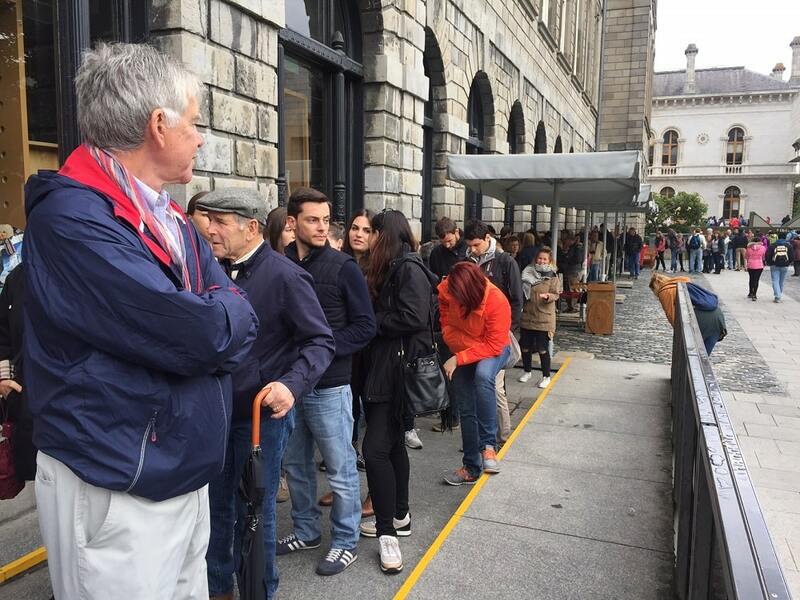 Get Book of Kells online tickets in advance to avoid a wait. Take a tour of Trinity College if you have time. Unfortunately, no photography is allowed inside the Book of Kells experience. Here are some more photos that will inspire you to visit Dublin. Disclosure: No financial compensation was received, but we did receive complimentary tickets to the Book of Kells exhibit. As always, opinions expressed here are my own. We are happy to co-host the Weekly Postcard Linkup. Everyone is invited to join us and share their travel blog posts here beginning at 12 p.m. (PST) / 8 p.m. (GMT) Friday. The instructions are below, but if you have any questions, feel free to reach out to us. Happy Travels! This looks really fascinating. I actually studied a little Irish history at uni, so this would really be something I’d get a kick out of. Can’t wait to visit Ireland when I get the chance, this will definitely be on my itinerary. Will keep your tips in mind. David – Thanks so much. You will love Ireland. The history there is fascinating and the scenery is beautiful. More about my trip to Ireland to come. Thanks so much Upeksha! I hope you get to visit and see it for yourself. This was a fascinating read, I didn’t actually know all of this information about the Book of Kells and I was glued to this post. Thank you so much for sharing such an interesting experience with us, really do appreciate it! Angie – Thanks so much for the nice comment. You really should visit the exhibit there was so much more fascinating information but I couldn’t fit it all in the post. Anna – Yes, the Long Room is just amazing, so glad you enjoyed the pictures. I hope you get to visit someday! I ran out of time to see the book of Kells in Dublin. I’d love to go back and see it. So fascinating. I managed to see the Domesday book in Rochester, UK. Such history. Laura – That’s understandable, there is so much in Dublin! I would love to see the Doomsday book in person, that is another amazing piece of history. Every time I see a photo of the Long Room I move Ireland and in particular Dublin higher on my list. Funny, I’m not a book worm but so drawn the amazing libraries of Europe. Interesting history about the Book of Kells. Thanks Lynn. I love Ireland and have been several times. Still planning on going back because there is just so much to see. So more coming up on the blog. One of the favourite activities I recommend to anyone travelling to Dublin or Ireland. It’s a phenomenal tour. Especially love the Long Room. Thanks Breifne! Glad to hear you enjoyed it too. Wow!!! I’ve never been to Trinity College and I would have brushed off the library, too, thinking how special could a library be, right? But what an incredible history lesson! That long room looks spectacular. If you are a book lover, you’d be in seventh heaven! 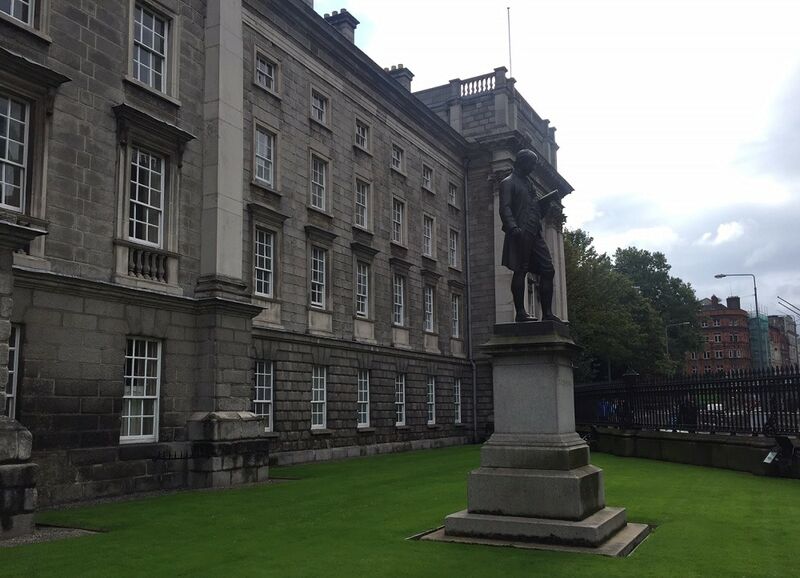 We visited the Book of Kells this summer and loved our tour of Trinity College! Thanks Hilary. Glad to hear you liked it too! Thanks so much Tais! Yes the Book of Kells really is a piece of art. Unfortunately in that exhibit you can’t take photos. Awesome. I’ve been to Dublin but had no idea about this. The Long Room is stunning! I must go! Corinne – Yes! The Book of Kells exhibit is really interesting too! This has been on my list for so long you have inspired me to keep it on there. Looks amazing hopefully next year. Michele – That’s great to hear. More about Dublin and the rest of my trip to Ireland coming up, so stay tuned! Thanks, Anisa, for your great post! I love libraries and books, so for me, this would be a must-see in Dublin! I’ll have to start looking for affordable flights! Eva – Excellent, you will love Dublin. More about my time there coming up on the blog…. Really interesting post! I love visiting old libraries and universities – I spent a few days in Cambridge UK and adored the architecture. Much more inspiring to learn than my ultra-modern looking uni! I will definitely have to visit Trinity when I make it to Ireland one day! Danielle – I love Cambridge too, such a pretty city. Yes, I think you would really like Ireland, hope you can make it there soon. Thanks Tanya. Glad to hear you enjoyed it. I actually saw the Book of Kells just last August but was like what’s the big deal? because I didn’t do my Irish history homework lol. But the library is amazing! Claire – lol yeah its not something I knew a lot about in advance but the exhibit does a great job explaining it. And agree the library is really impressive. I enjoyed, as well, when we visited a couple of years ago. Thanks Becky. Glad to here you enjoyed it as well. Do the students at Trinity College use this library or is it mainly a museum? I just LOVE your photos of the Long Room. I’m not very familiar with the Book of Kells and may have bypassed it initially. But now that you’ve told us so much, I’m quite curious to have a look at it myself. Michele – Thanks so much. I am not sure that it is really a library for students. The books there are probably priceless.